Battery has LTP Blade Style Terminals. Batteries ship from various warehouses and usually deliver within 5 to 7 business days. The Lifeline GPL-8DL is a high performance, Mil-Spec, AGM battery, produced in the United States. Due to the Lifeline Battery's quality construction, it has an industry leading 2% per month self discharge rate at 77°F (25°C). These batteries off gas only 2% by volume under normal operating conditions, again, industry leading. No sulfuric acid leaks, no acid clean up, and more power in the same space when compared to conventional batteries. The GPL-8DL is designed for charging amperages up to 637.5 amps or 250% of the rated Amp Hour Capacity due to low battery internal resistance. 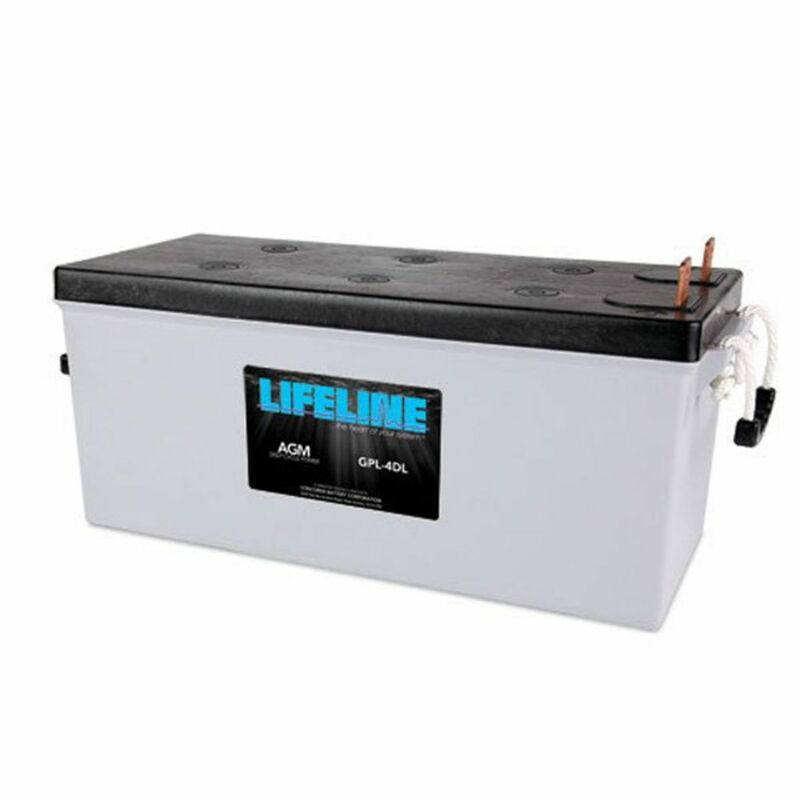 Lifeline Batteries are manufactured in West Covina, California by the Concorde Battery Corporation and is a US family owned and operated company. The Lifeline Battery technology is a direct spin off from Concorde's industry leading aerospace battery lines. All of these batteries satisfy the rigorous demands from many branches of the US Military and a host of industrial and private sector applications. Coast Guard approved, DOT Haz Mat Exempt, and longer lifespans than conventional batteries. Warrantied installations include marine, yacht, and other seafaring applications. Typically AGM batteries DO NOT require a special battery charger as charge requirements are similar to Wet Cell or other types of Maintenance Free batteries. If you are in unsure about the charger you need please contact one of our technical advisors. Batteries ship from various warehouses and usually deliver within 7 working days. Discount quantity pricing available please contact us by email or by phone during business hours. *Free shipping does not include fees for highly rural location, hard to reach locations, islands or location requiring ferry's. These locations may be subject to additional shipping fees. You will be advised prior to your order being processed if additional fees are required, at which point you may proceed with the order if accepted. Do you own the GPL-8DL? Please, tell us what you think about it. It helps us provide you with better products. Please note that it may take up to 72 hours for your review to appear.